Middle East Facts: Israel's Legal Right to Judea and Samaria is Enshrined in International Law! Israel's Legal Right to Judea and Samaria is Enshrined in International Law! the Palestine Mandate recognizing the Jewish people's historical connection with Palestine." Israel's Legal Right to Samaria is Enshrined in International Law! A cold, hard look at the law reveals an undeniable if inconvenient (for some) truth: Israel and the Jewish People have full sovereign rights to Judea and Samaria (the West Bank). A fair and objective analysis of the various post-WWI international declarations, agreements, decisions and treaties regarding the Question of Palestine (not to be confused with today's made-up "Palestine" claimed by the "Palestinians") can only lead to this conclusion. Perhaps the most significant of these decisions was the San Remo Resolution of 1920, which recognized the exclusive national rights of the Jewish People to the Land of Israel on the strength of their historical connection to the territory then known as Palestine (Eretz Yisrael). The outcome of this resolution was the 1922 Mandate for Palestine, an historical League of Nations document that formally established the legal right for Jews to settle anywhere in western Palestine, between the Jordan River and the Mediterranean Sea. This of course includes all of Judea and Samaria. It is this Mandate for Palestine which was later to become the foundational legal document for today's State of Israel and which grants the legal right for Israeli sovereinty over all of the "West Bank". Moreover, in San Remo, the nations of the world had formally obligated themselves to not only establish a Jewish state in Palestine, the historic and biblical Jewish Homeland, but also to facilitate its development as well (see Article 6 of the still-binding Mandate for Palestine). This plainly means that today's Israeli settlements are in fact 100% legal and that the false accusation of "occupation" is nothing but a politically-motivated obfuscation of the truth. People forget that back then, the concept of a "Palestinian People" was unheard of and "Palestine" referred only to the Levantine cradle of the Nation of Israel and never to an Arab nation or state. From San Remo to Samaria: Following the WWI defeat of the Turkish Ottoman Empire, the League of Nations (precursor to the U.N.) decided to divide up the huge landmass of the vanquished Ottomans as follows: a mandate, or trusteeship, for France (Lebanon and Syria) and a mandate for Britain (Mesopotamia [today's Iraq] and Palestine [comprising of what is today Israel, Gaza, Judea, Samaria and Jordan]). As a result of Turkey's defeat, sovereignty over these lands passed from the Ottomans to the Principal Allied Powers (the leaders of the victorious Allies), who then assigned these rights of supreme authority over to their respective mandates. In the case of Palestine, this means that the last legal sovereign power over the Holy Land was the British Mandate, whose raison d'etre was to "reconstitute" there the national homeland of the Jewish People, which was understood to mean statehood. Thus, ever since the end of WWI, no Arab entity has ever had any legal sovereign rights to Western Palestine, which includes Judea and Samaria. It was on this basis that the British Mandate was established. The San Remo Agreement was the last legally binding international decision regarding the rights to what is today known as the West Bank, and thus, according to international law which is still binding to this day, these parts, Judea and Samaria, rightfully belong to Israel and the Jewish People, period. "The San Remo decision...is the most momentous political event in the whole history of our (Zionist) movement, and, it is perhaps, no exaggeration to say in the whole history of our people since the Exiles"
Powerful words indeed, yet regrettably so unfamiliar. Just how many of today's "middle east experts", journalists and opinion makers know the details of this and other important international agreements from that era? How many of them have even a rudimentary understanding of San Remo's historical and legal significance for Israel, the Jewish People and the Mid-East region? * Balfour Declaration, San Remo Agreement, Treaty of Versailles, Treaty of Sèvres, League of Nations Covenant and Mandate for Palestine, Treaty of Lausanne, 1924 Anglo-American Convention. So, if the post-WWI world powers ratified into international law the establishment of a Jewish state within the boundaries of Mandatory Palestine, how is it that we hear nothing about this today? Why has this landmark decision, still legally binding to this day, completely disappeared from today's Mid-East narrative? By what legal right do the nations of the world shirk their obligations and deny the State of Israel and the Jewish people their due? Suffice to say that if the truth, any truth, is not actively taught and preserved and if the facts are forgotten, falsity and misinformation fill the vacuum. That is why Left-wing terminology such as "Inalienable Palestinian Rights", "Israeli Occupation", "Illegal Settlements" and "1967 Borders" have become so pervasive and automatically accepted today. Renowned legal scholar and jurist Dr. Jacques Gauthier, a non-Jewish Canadian attorney specializing in international law as it applies to Israel and her territories, has not forgotten the facts. The video below is his address to the ICEJ conference in Jerusalem, September 2010. Invest 16 minutes of your time to watch minutes 34:13 to 50:36 as he eloquently and passionately encapsulates the legal foundation for Israel's sovereign rights over Judea and Samaria. A must-view video for those who really want to understand Israel's legal and political rights to Judea and Samaria and the legitimacy of the settlements therein. The dissolution of the League of Nations in 1946 in no way altered the Jewish People's rights to Judea and Samaria, given to them by the world powers, first in San Remo, then in the provisions of the Mandate for Palestine. This is because when the United Nations was established, Article 80 of its charter clearly specified that rights previously granted by the League would still be legally binding. Regarding Israel's legal right to a national home (i.e. statehood), there is a popular misconception that the November 29th, 1947 United Nations Resolution 181 ("Partition Plan") granted the Jewish People this right to (a small part of) what was then Palestine. It didn't. In fact, as mentioned above, it was a series of post-WWI international agreements, notably the 1920 San Remo Resolution and the 1922 Mandate for Palestine, which were the true source of Jewish legal rights to all of Palestine, and subsequently, to the State of Israel. To claim otherwise is a misreading of history and is dangerous because it significantly limits the amount of state land that Israel can rightly claim under international law. It also erroneously sets the starting point for any negotiations with the Arabs along the indefensible 1947 partition "borders", rather than along the much more generous and secure boundaries of Greater Israel, which includes Judea and Samaria, as provided for by the Mandate for Palestine. 1. At the time when the UN General Assembly met to decide on the plan to partition Palestine, the 1922 Mandate was still legally in full effect. The Mandate explicitly prohibited (Article 5) the transfer of any land under its jurisdiction, that is, any part of the Jewish National Home, to the control of any foreign power. 2. The proposal to partition Palestine was a recommendation only and not a legally binding decision. According to UN's charter, the General Assembly did not have the authority to make binding decisions, only recommendations (with certain exceptions such as the approval of the UN's budget). 3. While the Zionist leadership at the time reluctantly accepted the partition proposal, it was nonetheless rejected out of hand by both the local Arab leadership as well as by all the Arab countries. This outright rejection, in and of itself, should have rendered the plan null and void from the start. 4. Furthermore, the Arabs grossly violated the plan when they brazenly invaded the newborn State of Israel with the intent to annihilate her, thereby nullifying out-and-out even the moral validity of the decision. 5. Since the United Nations, as successor to the League of Nations which granted the Jewish People the legal right to Palestine, is obliged to meet the obligations of the British Mandate regarding territories in the Jewish National Home (pursuant to Article 80 of its charter), and since the Partition Plan wholly violated Article 80, this plan was clearly invalid from the start and should be regarded as illegal, null and void. In the aftermath of the defensive war of June 1967, forty-five years after the League of Nations' landmark decision to implement the Mandate for Palestine, Israel finally retrieved some of the territory assigned to her and the Jewish People as a National Home. How the possession of her own homeland can possibly be considered the "Occupation of Palestinian territories" is beyond explanation. What is most tragic and ironic is that all too many of the Jews themselves have adopted this usage and even made it a cornerstone of their own national policy! under which Jews settled in Haifa, Tel Aviv and Jerusalem before the state of Israel was created." 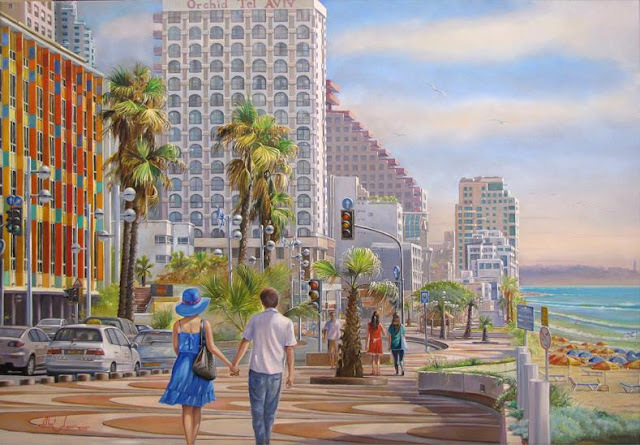 Pictured: "Tel Aviv's Romantic Promenade" by Alex Levin. All rights reserved. Howard Grief z"l, a renowned expert in international law and one of the foremost authorities on Israel's legal rights to Judea and Samaria, had labored tirelessly for decades to make his "ironclad legal case" for the exclusive Jewish legal rights to the Land of Israel. The author of "The Legal Foundation and Borders of Israel Under International Law", Professor Grief's knowledge of this subject was encyclopedic. As per Grief, "there is no such thing as occupied territories for Israel. This is the greatest hoax and myth of the last part of the twentieth century and now in the 21st century". His essay "Legal Rights and Title of Sovereignty of the Jewish People to the Land of Israel and Palestine under International Law" can be read here. Also, click here for an exhaustive study of the Jewish legal rights to Judea and Samaria by Myths and Facts author Eli Hertz. Constant Jewish Presence. Samaria is the cradle of Jewish history, reaching all the way back to the time of Abraham the Patriarch, some 3700 years ago (see Genesis, chap. 12). Despite numerous expulsions over the centuries, the Jews nonetheless maintained a continuous presence in their beloved homeland ever since they first crossed over the Jordan River and entered into the land under Joshua's leadership nearly 3300 years ago (10th day of Nissan, 2488 [1272 B.C.E.]). Innumerable archeological findings uncovered in the Shomron bear witness to the presence of the Jewish People in their homeland going back millennia. The magnificent 3,285 year old Alter of Joshua on Mount Eval is a shining example (click here for more detail). The ancient remains of King Ahab'spalace and King Herod's works can be seen today in Sebastia, near the settlement of Shavei Shomron. Especially intriguing are the Samaria Ostraca, potsherds with ancient Hebrew inscriptions found in Ahab's palace. This spectacular find corroborates the Biblical narrative regarding the names of the the Israelite clans of Manasseh and their connection to the land. It verifies the Biblical account (in the books of Numbers and Joshua) and confirms that the Jews were rooted in Samaria some 1500 years before the birth of Islam. See the actual study here. time-honored Jewish rights to this land. A view of the Kana Nature Reserve, Karnei Shomron. 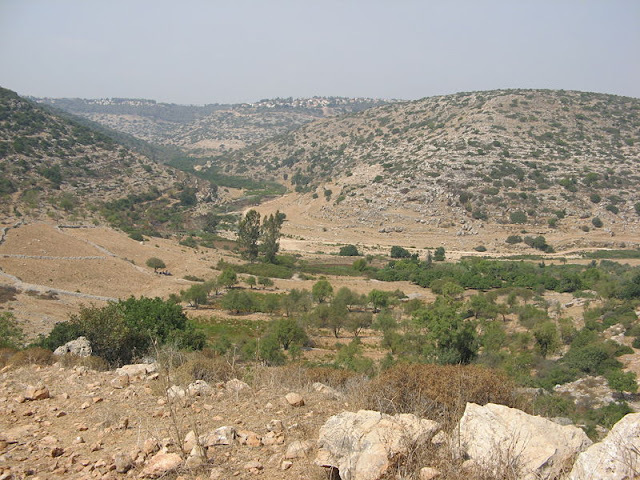 In Biblical times, the Kana Stream (center) divided the tribal portions of Ephraim and Manasseh. The Birthright of the Jewish people. The Torah (Jewish Bible) says explicitly and unequivocally that the Land of Israel is the Devinely-given patrimony of the Jewish People. This is the Jews' oldest and strongest claim to the land and on that basis alone the Shomron and all the rest of the land should rightfully be in their sole possession. For millenia Jews had yearned for the return to Zion and the Land of Israel. The practice of their religion in exile, far from their homeland, has always been an adaptation and a compromise. In fact, a truly authentic and complete fulfillment of Judaism requires a presence in Eretz Yisrael. The Jews' presence in and ownership of their homeland is only natural and they need not apologize for it. Ironically, today's Israelis, who so jealously guard their day-to-day mundane rights such as that parking spot they saw first or their place on line at the bank, would blithely give away that which is rightfully theirs - their patrimony, no less! - when they really don't need to. I agree with Ms Avraham. 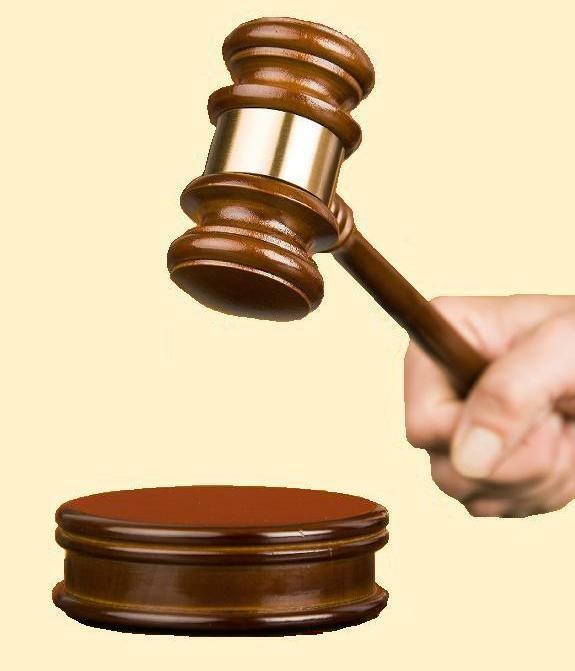 SSRN.com/astract=2385304 It seems to me that "Where the prior holder of territory had seized the territory unlawfully, the state which subsequently takes that territory in the lawful exercise of self-defense" has "liberated" the territory. It is not "occupied" in the sense of a "belligerent occupation" as that term is used in 4th Hague Convention which assumes in Article 43 that the state that has been dispossessed is the legitimate sovereign over that territory. In 1948, the collective political rights to self-determination in Palestine were in a trust in which the Jewish People were the beneficiary. In 1948, just as the Arab Legion, officered and supplied by Perfidious Albion invaded eastward, those collective political rights vested in the Jews and in 1967 when they obtained united control over the remainder of the territory of Palestine west of the Jordan, their beneficial interest was changed to legal dominion. Israel should send troops to arrest Abbas for inciting violence. He is not above the law. Any person or group who incites violence against the Jewish people must be declared an enemy of Israel and treated as such. If the Arabs cannot live in peace with the Jews in Greater Israel, the only solution is to evict them to Jordan or Gaza. Enough is enough. It's time for Israel to take off the gloves and take the necessary steps to protect the Jewish people in Israel. One of the fundamental obligations of the government is to protect its citizens at all costs. Israel must adopt a policy of zero tolerance. By pacifying the Arabs and the world nations, Israel's government is failing to take care of the Jewish people. It should not be necessary to remind the government that the Jewish people have suffered for over 2000 years at the hands of other people or nations who terrorized the Jewish people in Diaspora. Now the Jews in their own country must be protected at all costs. Israel has the power, means and resources to stop the ghetto mentality. Israel's government must overcome the leftist attitude and their delusional mentality, Israel must hit hard all terrorists and perpetrators of violence with a no reprieve, "damn the torpedoes" policy. If the current government cannot protect its people, its time to change the government. Less talk and more action and results. "In Israel; we have to undue and reverse the decades of nonsense that the peace industry has fermented, which led us to the position where the world thinks we the Jews are occupiers in our own ancestral land. If something is false and it is repeated enough times it becomes sort of common wisdom. We have to undo that." Never will there be an Arab-Palestine state in Israel west of Jordan River. The Law of Return is for The Jews, the option to return to Greater Israel and The Arab-Palestinians to leave Greater Israel and return to the Arab countries they originated from. The Arab-Palestinians should move to the Million plus Jewish homes confiscated by the Arab countries from the expelled Jewish people and the 120,440 sq. km. of Real property the Arabs confiscated from the million plus Jewish families and their children expelled from Arab countries. That is the only viable alternative. Face it and stop hallucinating, once and for all. 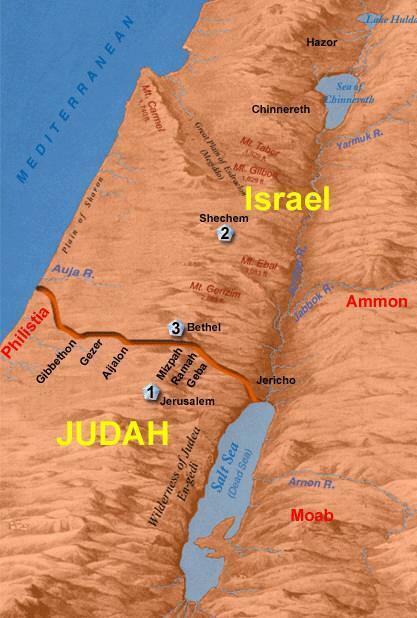 There will never be an Arab-Palestinian State in Greater Israel West of the Jordan River (Judea and Samaria). Jerusalem is the United Eternal Capital of the Jewish people. upon the constitution of the League of Nations. regard itself as the first meeting of the league. the exploitation of weaker nationalities. would resemble the Versailles Council. conscription is the tarpot of militarism. Our opinions and perspectives are shaped by many things including our backgrounds and biases. When two people look at the same incident at the same time, it is quite possible that they take away very different stories. When two people do not see things first-hand, but hear histories second and third-hand, the narratives of each could appear to describe two different events and worlds. Yet, those strange worlds can coexist and the parties with alternative truths can get along. The reason is not solely because some events in question are not in direct conflict, but because those events do not define each party. Many histories remain in the past and do not touch the present. Other narratives reach out from history and impact decisions and views of people in the present. The deepest – and potentially most dangerous – narratives are those that are embedded in a person’s psyche, which can distort history, make people act against their own interests and mar the future.